Any ideas, people? Simpler? Shorter? Less science? More science? BTW - This is a serious question. Here's a chance for you to have your say. Update: Lucia has kindly responded on Twitter, but was unable to think of (or put into words) any suggestions for making it easier for her and other deniers to understand science. It may be that the problem isn't me after all. Or it could be that the blog format isn't suitable for some people. If I had the talent, I'd try comic strips. I remember one denier at HotCopper complaining that a science paper had too many words and not enough pictures - really and truly. They did. Update2: Lucia has added two ideas - to pace myself - good tip. To not make snide remarks about Jim Steele's ongoing nasty baseless personal one-way vendetta with Camille Parmesan. I'll pass. She also said that writing ideas on Twitter is difficult. She hasn't yet twigged that she could write more than 140 characters here at HW. Which is a sort of tip - to try to factor in the intellectual capability and limited imagination of deniers when I write. This will be short-ish - by HotWhopper standards :). It's about a duo of articles at WUWT. About ice at opposite ends of the earth - Greenland and Antarctica. And based on historical analyses, Greenland will likely begin gaining mass in the coming years. Anthony Watts has done it again. Put up a really weird article that none but the scientifically illiterate could allow on their blog as a straight article. But as his friend Willis Eschebach pointed out so clearly, Anthony Watts is scientifically illiterate. Just the same, there are people commenting on his latest atrocity (archived here), which has prompted me to point out where he's gone wrong - which is just about everywhere. 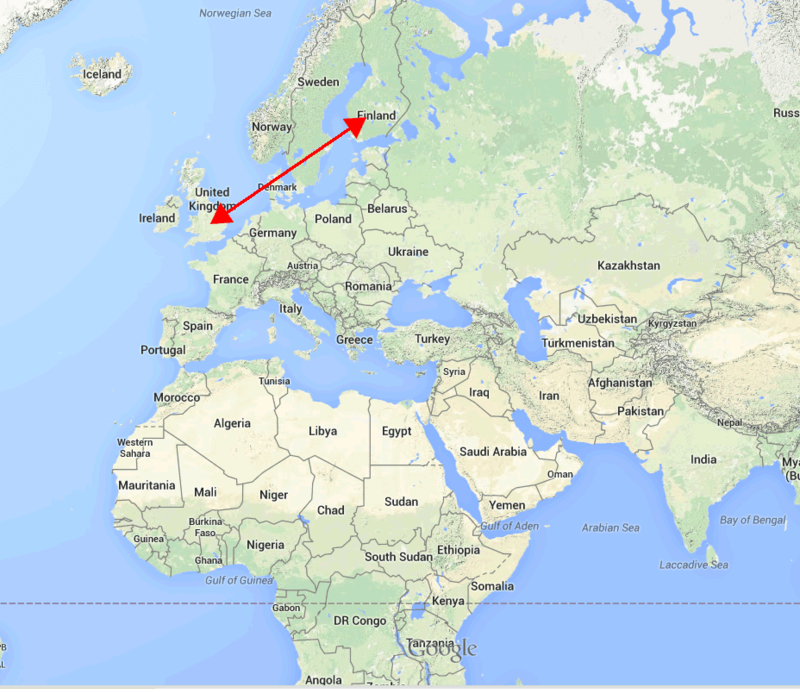 First, I'll put up the map of atmospheric CO2 that Ronald was writing about. It's the one shown by the OCO-2 team at AGU14. Click to enlarge it. Look at the legend at the bottom - the scale goes from 387 ppmv to 402.5 ppmv, which shows that the satellite is detecting CO2 at a very fine scale. Then look at the title up top. 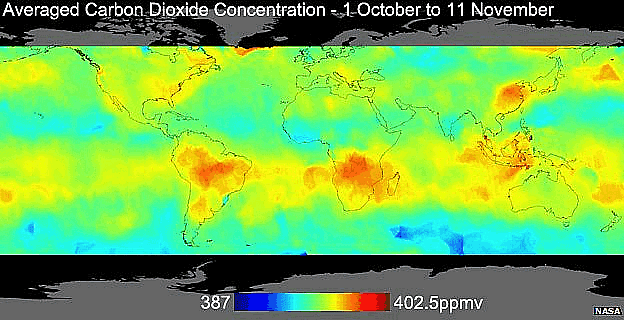 The map is of averaged carbon dioxide concentration over the few weeks from 1 October this year through to 11 November. You can read more about the Orbiting Carbon Observatory-2 on its website here, and you can browse the data released so far here. I also wrote about it a few days ago. To summarise, Ronald thinks that the OCO-2 project is a scam. A scientific plot against him and his fellow deniers, with results that are fudged or worse. He misinterprets the above chart. He wrongly thinks that it's insects and microbes that are causing CO2 to rise, not human activity. His logic is a massive fail - he neglects to explain how insects and microbes have suddenly been able to add about 900 billion tonnes of carbon or two trillion tonnes of CO2 to the air in a space of 150 years. Where is this explosive increase in microbes and insects, such that no-one noticed? Ronald doesn't say. This article wanders a bit into soils and bugs and microbes and other things so it's a bit long. But read on if you are interested in such things. Where has all the CO2 gone? WUWT fails arithmetic & science, so cries pHraud! In two very, very dumb articles at WUWT, one of which is a mainly a copy of a CFACT monstrosity elsewhere - there are foolish accusations of fraud about ocean acidification. Now anyone who is taken in by this nonsense should go stand in the corner and put on a dunce cap. Then they ought to enrol in a remedial arithmetic class. Thing is, experts have calculated how much extra CO2 humans have put in the atmosphere. It comes from burning fossil fuel, from land use changes, particularly deforestation, and from the making of cement. Only around half of what humans have emitted has stayed in the atmosphere. The rest is absorbed in the oceans and on land - with plants absorbing something like 30% of the extra and the oceans absorbing around 25%. If you look at it from another perspective, you'll see that the oceans must be absorbing more CO2. That other perspective is that the increase in atmospheric CO2 means an increase in the partial pressure of CO2. When partial pressure of a gas in contact with a solution rises, the solution dissolves more of the gas. If temperature increases, then all else being equal, the solution will give up the gas. However right now, even though the temperature is rising, the increase in partial pressure outstrips this rise - so the oceans are taking CO2 from the air. I started this article before the hols and although it's a bit stale now, it's a good example of how deniers are nothing if not inconsistent. So here it is. In another sign that WUWT doesn't know its ups from its downs, whether it's warming or cooling, there were two articles that pretty well contradicted each other. In the first article, Anthony Watts reckons that all the thermometers in Finland must be wrong because they show a "step change" in temperature from the late 1980s. In the second article, Paul Homewood talks about the "sharp rise" in UK temperatures from the 1980s as something that "everyone knows". The UK isn't really all that far from Finland, and the way the wind blows I expect they'd both often be influenced by the same weather patterns - though Finland can get quite a bit colder. So why would Anthony figure that Finland can't be getting any warmer while he posts an article on the very next day assuming that "everyone knows" that the UK has got a lot warmer? Well - it's Christmas Eve already. 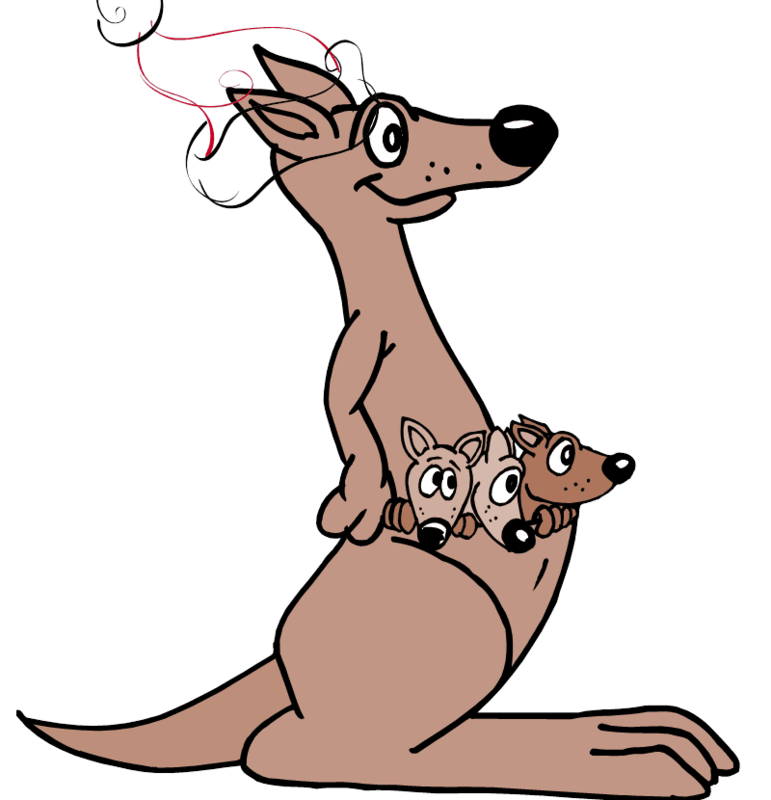 From sunny Australia let me wish you all happy holidays and a healthy, safe and successful 2015. May the weather be kind and the CO2 drop. 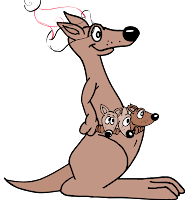 Jingle Bells with country musician Bucko (Colin Buchanan) and Champs (Greg Champion) of the Coodabeens and a bunch of people at a typical Australian Christmas. I'm flat out getting a few things done before the Christmas break, so this is just a short article. It's necessary because if you read WUWT, you'll leave it scratching your head wondering how it could claim to be a climate site. Before I begin, if anyone wants to read up on the carbon cycle, one of the best sites that describes it for the non-scientists out there, is NASA's Earth Observatory website. It takes 16 days to get a full set of global data, with a million readings a reading a day which yields tens of thousands of data points. What they have to do is determine differences of maybe only one or two parts per million (there are around 400 ppm of CO2 in the air today). I've been wanting to write this for a few days now, and have been prompted to get a move on by one of the sillier articles from conspiracy theorising Tim Ball (archived here). Anthony Watts has reported a poster (archived here). He doesn't comment on it. I doubt he understands it. Most of the people commenting at WUWT don't understand it either. And I don't blame them. Now I'm no Tamino, however in my view, what Pat Michaels and Chip Knappenberger have done, ostensibly, is flawed from the outset and demonstrates that they don't understand the CMIP5 climate models. Rather than show a chart with observations vs models (combined), what they've done is show a chart of trend changes. That's fine, but further down I'll explain why I believe the conclusions they draw are flawed. Anthony Watts takes a shot at the“American Traditions Institute” now known as the “Energy & Environment Legal Institute”. Thing is, he doesn't even know it (or if he does he didn't tell his readers). Today he posted an out of focus photo he took of the cheque Michael Mann gave to the Climate Science Legal Defense Fund. The cheque was the damages awarded by the court when ATI/EELI tried to get his personal emails. You may remember the case (see Washington Post article). The judge saw it for the harassment it was and awarded damages of $250 dollars to Michael Mann. Dr Mann wasn't looking for a payout. All he wanted was justice and to prove a point that he will not tolerate the sort of vexatious law suits that disinformers bring from time to time, when they harass and try to intimidate research scientists. 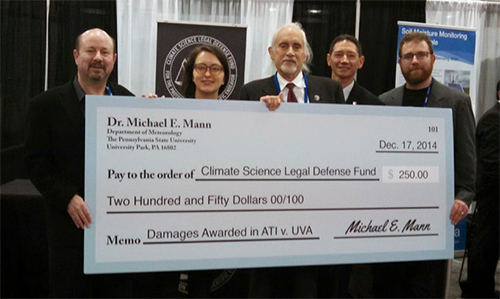 Dr. Michael Mann displays his court awarded damages check, won against the climate and science denying, fossil fuel funded “think” tank, “American Traditions Institute” aka, the “Energy & Environment Legal Institute”, after judges realized that actions against Dr. Mann were pure anti-science harassment and had no basis in fact. Wondering Willis Eschenbach looks for sunlight in the Arctic winter - yeah, really! Anthony Watts posted a press release from AGU14. That's all the "scientific" reporting he's capable of I'd say. The articles he's written himself are science-free, but he has managed a couple of press releases (he didn't have to go to any AGU meeting to copy and paste a press release). NASA satellite instruments have observed a marked increase in solar radiation absorbed in the Arctic since the year 2000 – a trend that aligns with the steady decrease in Arctic sea ice during the same period. Note: to find out how to see the science at AGU14 - click here. Last year Anthony Watts, anti-science blogger a WUWT, heard someone grunting at him, when they didn't. This time he saw a sneer, but couldn't take a photo of it. Anthony isn't great with words as you know. He rarely writes blog articles himself. Almost never will you see a comment on science by Anthony Watts beyond the added word "claim" in a headline, except for the occasional silly article like how Russian Steampipes Cause AGW. Anthony can manage a dogwhistle but that's about as far as he can go. Why people figured it was worth the money to send him to report on AGU14 is anyone's guess. Brandon R. Gates has been commenting here and at WUWT lately. Yesterday he put three questions to Bob Tisdale, whose answers gives us more insight into how Bob operates (or doesn't). And since Bob himself suggested something about HotWhopper, let's take him up on his offer - except that I'll do my best not to misrepresent him. In fact I'll paste Bob's answers to the questions in full, thereby removing that risk altogether. Here goes. Today the Australian Bureau of Meteorology released its fortnightly ENSO wrap up. It is still calling an "alert" but not a declared El Niño. You can read the details below, and on the HW sidebar and here at BoM (with the pdf for the record). You might have noticed I've not written about the numerous Anthony Watts' articles from AGU14 yet. That's because there aren't any. From Day 1 the only "reports" from Anthony are two tweets - here and here, unless you count his latest Michael Mann bashing (archived here), which looks as if it was written before Anthony went to AGU. At WUWT a day or so ago, the ethically-challenged Anthony Watts thought it's "hilarious" that Professor Mann should give a talk about professional ethics. Anthony doesn't have an ethical bone in his body when it comes to climate discourse. I doubt he understands the meaning of the word "ethics". Richard talks in his usual lively manner, with an early reference to the possibility that some things may happen very quickly, much faster than economic discounting allows. He talks about how faster, less-expected changes would be very damaging to economies and ecosystems. He says that "in some sense, we are searching for the dragons that are out there" - in a reference to a fifteenth century map showing where "here be dragons". He points out that when we discover a possible dragon part we examine it further - and often find that it's "not likely to eat us" - or we may find that it is indeed really dangerous. We are just pressing against every part of the ecosystem and biodiversity in multiple ways now, because of the scale of economic activity. I've just been watching Jeffrey Sachs talking about global change from an economic, political and diplomatic viewpoint. His theme was scale. It's one of those lectures that helps you take a step back and see things in the wider perspective - and what is happening on the political and diplomatic stage. [Here's the link to the HotWhopper guide to virtually attending AGU14. Once you have registered, logged in and gone to the video page, you can search for "Sachs" to see the video. Update - I've added a bit on trends and anomalies, highlighting Bob's deception - just in case a stray arrives from WUWT. Sou 15 Dec 14. Bob Tisdale has got himself into a real tizz over the record hot seas. He's posted several articles about how the seas are only getting hotter because they are getting hotter. Six just in the last week at WUWT, would you believe! It's not that they are getting hotter from global warming. They just happen to be getting hotter. Bob seems to think it's got nothing to do with global warming. It's just warming. 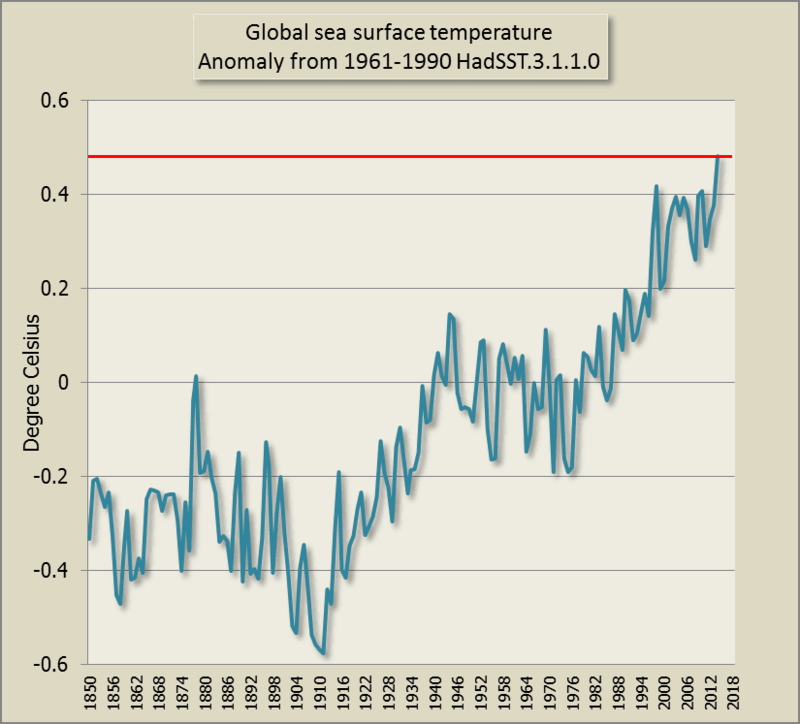 Bob's article had the rather long title: "The Nonsensical “Just What AGW predicts” and Other Claims By Alarmists about “Record-High” Global Sea Surface Temperatures in 2014"
Be warned - this article is a bit long-ish. While it's too, too easy to ridicule Bob's stupid greenhouse effect denial, that's not what made this article long. 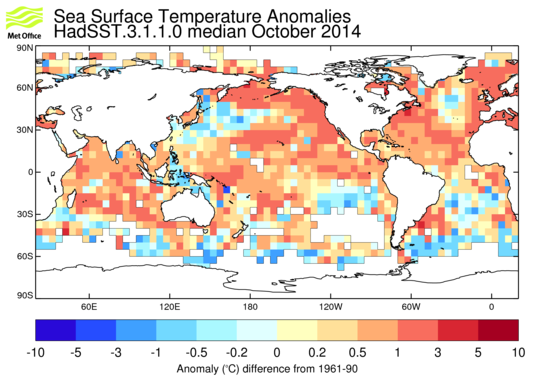 What happened was that I got sidetracked down various other sea surface temperature pathways. Rather than leave you hanging, I went looking for something to tempt the science in you - and found a treasure trove of papers. That is, if you are interested in birds. In particular, if you are interested in the evolution of birds. Remember when Wondering Willis wrote that scathing piece about Anthony Watts and WUWT, saying that Anthony couldn't tell good science from pseudo-science crap even if he had a year to think about it? His article was one long insult to Anthony and WUWT. Now Bob Tisdale has done the same (archived here). In another full-on insult to WUWT, Bob writes how he finds it unbelievable that any proper science site would take the least bit of notice of the nonsense that goes on at Anthony Watts' blog. What that tells you is that now two of the most prolific writers at WUWT have a fairly realistic picture of WUWT's place in the world. Both Willis Eschenbach and Bob Tisdale view Anthony Watts in the same way as most other people do. Anthony Watts runs a fringe blog that is not to be taken seriously by anyone, let alone by anyone who knows anything about climate science. When two of Anthony's staunchest allies come out with this sort of thing, you see that they realise that WUWT is just another inconsequential blog that happens to attract a lot of people - but not the type of audience anyone would want to boast about. Congratulations to RealClimate on its Ten Year Anniversary. Many readers would be long term fans of RealClimate.org. When I was learning about climate it was my first major resource and is to this day. Through realclimate.org we got to know not just the science of climate but also the people of climate. The articles by the realclimate team and guest contributors have made science accessible, bridging the gap between science journals and science articles in the media. From there, many of us have found reading science papers in journals so much easier. The people who started RealClimate ten years ago have become leaders in the field of climate science and leaders in the climate community. They have achieved a huge amount in their own careers as well as being known throughout the world as science communicators. They have continued to volunteer their personal time and efforts to helping us learn about climate, while their jobs have become more demanding, their families have been growing, more and more journalists have been querying (and more and more people are pestering). They have let us get to know not just their work, but them as people - different personalities, charm and even little idiosyncrasies and foibles. Their patience and endurance and amazing generosity has been a source of inspiration to many, many people. I cannot think of another field in which a group of scientists have shown the sort of continuous dedication to bringing science to the public, from realclimate.org and beyond. They are amazing. Now go over to realclimate.org and tell them congrats and thank you - here and here. No surprise, Judith Curry is trying to spin the hot weather we've been having these last few months making out it isn't important (archived here). I'm not going to comment on her article except for a couple of things. She talks up a dreadful article by Matt Ridley (see ATTP and Greg Laden), which got people all a twitter. Judith favours deniers and the GWPF, so that's no surprise. In other words, don't fall for Judith Curry's spin. She's not good at it, so I don't expect you do, no more than you fall for Matt Ridley's spin. And you'll notice they spin each other. ...The Japan Meteorological Agency (JMA) forecast last month that the possibility of an El Niño pattern forming this winter was higher than the 50% it had projected in its previous monthly prediction. But on Wednesday it said that an El Niño had emerged between June and August, continuing into November. “We can’t tell whether or not El Niño will continue until spring, but we can say that there is a higher chance of it continuing in the winter,” said Ikuo Yoshikawa, a JMA forecaster. The Japanese weather bureau does not classify or predict the size of El Niño, he said. Update - having read the JMA outlook of 10 December, the Reuters article at the Guardian seems more certain than JMA itself. Sometimes you've got to read it to believe it. Deniers are such hypocrites. One day they'll pretend they care about vulnerable people in less developed countries and claim they want to sell them coal and oil so they can trade poverty for broken families and emphysema. Next minute they are bagging a call for nations to honour their commitment to help less developed countries, citing nutty conspiracy theories. You may also recall that deniers have no compunction in sending money to Anthony Watts so he can go on a junket with no accountability and piss poor "reporting". Anthony himself isn't too proud to beg for handouts, and he lives in prosperous California. But he cannot abide the notion that the US or any other prosperous country would assist those less well off. When it comes to giving foreign aid to nations in need, as part of an agreed commitment by wealthy nations, deniers groan and moan and mutter expletives. Are you into gymnastics? You might remember a while back how Anthony Watts and WUWT did an about face and embraced a paper co-authored by Dr Phil Jones. Well, today he's done a backflip and decided that a new paper, which looks to be on a similar but not identical topic to the previous research (which Anthony loved) is no good. Greenhouse effect denier Bob Tisdale has branched out into slaying dragons in the ocean (archived here). Bob does his best to hide the warming, usually by showing surface temperature changes in parts of the ocean that haven't warmed as much as others. The next best thing to attending AGU Fall Meeting 2014 in person and catching up with all the scientist pop stars, is to virtually attend. There's a paper out in Nature Communications, in which PhD student Chris Boulton and colleagues say they've detected signals that can be used as an early warning of a collapse of the Atlantic Meridional Overturning Circulation (AMOC). They used a coupled climate model that showed that these signals could become significant about 250 years before the start of any collapse, and, going by the charts in the paper, may start to be seen sooner than that. 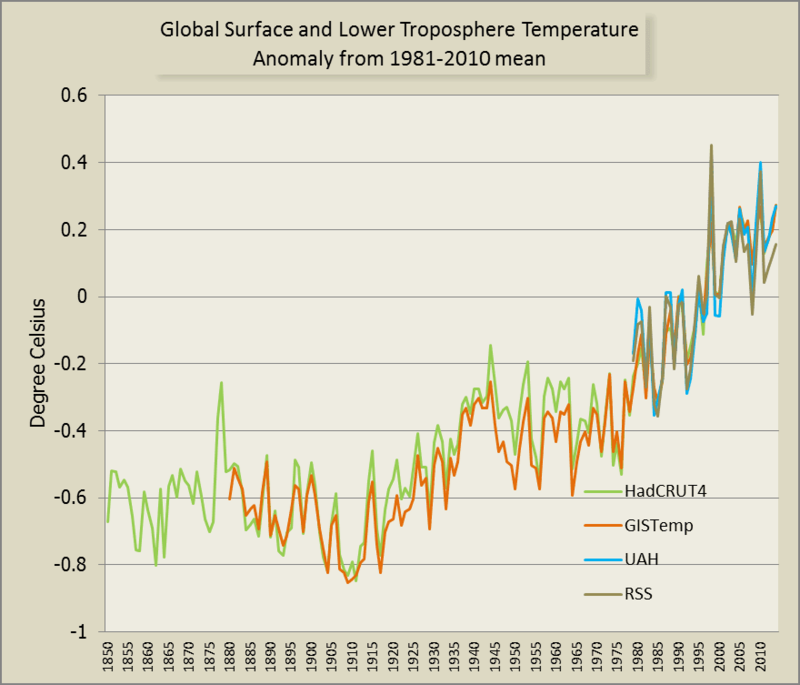 Change points in global surface temperature: and by what magic is earth warming? Quite often you'll read deniers claiming that the earth is warming by magic, or supernatural forces. No denier will ever use the words "magic" or "supernatural". They'll pick a euphemism, like "Little Ice Age" - though how an ice age caused warming I've yet to see anyone explain. An ice age won't cause cooling or warming. An ice age is a state not a force. Sometimes a fake sceptic will add that it's because of a recovery from an ice age, as if warm was a natural state and cold an unnatural state. Yet that would require an explanation of how earth got into the unnatural state and what forced it out of that unnatural state. A lot of deniers think of climate as a bouncing ball minus the forcing that causes the ball to bounce. And they don't seem to mind that the bounce up in the global surface temperature is showing no sign of bouncing back down, although some of them swear that we're heading for an ice age - any day now. Occasionally there'll be a vague explanation for the unnatural state, usually something to do with the sun - but with little enthusiasm. (The sun may have played a minor role during the Little Ice Age, recent research points to the cause of it being heightened volcanic activity, which is thought to have driven changes in the ocean which caused more cooling. See papers below.) And when one asks, well what about the decline in solar forcing recently - why hasn't it cooled down? You'll be lucky to get a response. Viv Forbes is lashing out again. This time he's not lashing out at environmentalists so much as Australia's Prime Minister Tony Abbott and a rival global mining company Glencore. Glencore merged with Xstrata a while back and bought it out in May last year. Although WUWT doesn't declare the fact, Viv Forbes is a director of another mining company, Stanmore Coal. Both Glencore and Stanmore have operations in Queensland. Exploration companies aren't looking for oil in enough places in Australia, or so Viv says. Viv has somehow linked these three items to the second World War and what he calls "foolish green energy policies and the suicidal war on carbon fuels". He might even be yearning for another war, it's hard to tell. I expect what he's really saying is that governments should bail out car manufacturers and grant huge subsidies to prop up foreign-owned mining operations in Australia. The links he's made in his article are tenuous at best. But what the heck, anything to have a go at nasty governments (even if they are of your own choosing) and environmental sustainability. Who needs a Tony Abbott or a planet after all, when you've got coal to sell? According to research carried out by Daniel Griffin from the University of Minnesota and Kevin Anchukaitis from Woods Hole Oceanographic Institution, the current drought in California is the worst in at least 1,200 years. 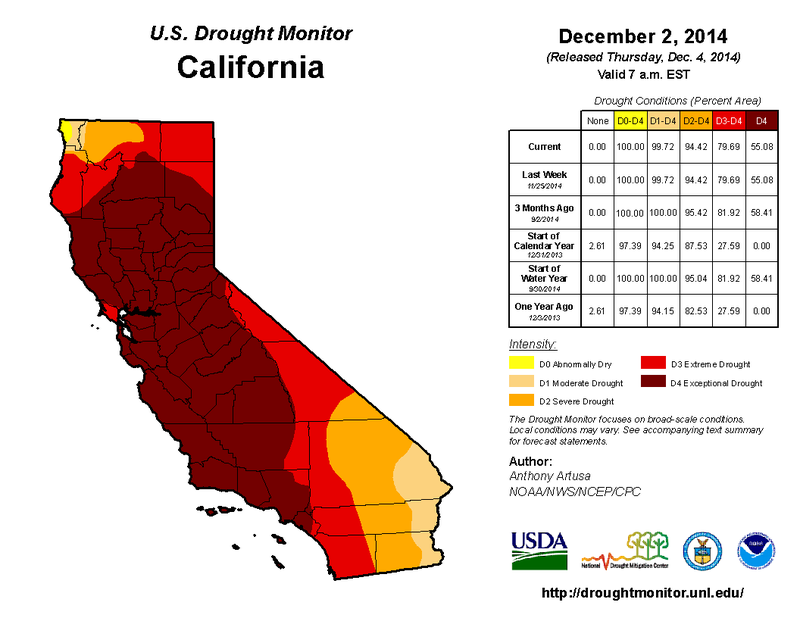 Here is the latest drought update for California from the US Drought Monitor, which wouldn't include the recent rain. It's for the 2 December - four days ago. From what I read, it will take quite a bit more than this week's downpours to lift California out of its drought. Anthony Watts has put out his hand again for his readers to pay their WUWT dues. He wants them to fork up for his air fare accommodation and parking and meals and whatever else when he goes to the AGU Fall meeting (AGU14). Someone emailed me that it's known as Internet panhandling. More comfortable than standing on a street corner and much more lucrative. This time, wisely, Anthony made no promises other than to say that he wanted to keep "tabs on the antics of people like Michael Mann, Peter Gleick, and some of the other players". So I guess he'll be skulking around the corridors of the Moscone Center with his video camera at the ready, and complaining again about being ignored or not recognised or hearing non-existent grunts. Anthony couldn't even be bothered writing a fresh article this year. He just updated the same article he wrote in 2013 - compare to this year's plea. This year he didn't add in the cost of attendance, which I understand is free to people who manage to swing a press pass, like Anthony did last year. ignore him, maybe glancing at him blankly and muttering to each other when passing "who the heck was that weirdo"? Wondering Willis Eschenbach is delighted (archived here) that over the whole world, action on climate change is considered the lowest of sixteen priorities. He was talking about the "My World" internet survey that I wrote about a couple of months ago. Willis is late to the party. He's behind his rival Bob Tisdale, who wrote about it in September this year at WUWT. The oddity in all this is that Willis spends so much of his time protesting climate change and climate action. He spends a lot of time writing pseudo-science for a blog that is devoted to rejecting climate science and protesting any action to mitigate climate change. At the same time he reckons that nobody thinks that climate change is important. Perhaps he needs to re-think his own priorities. 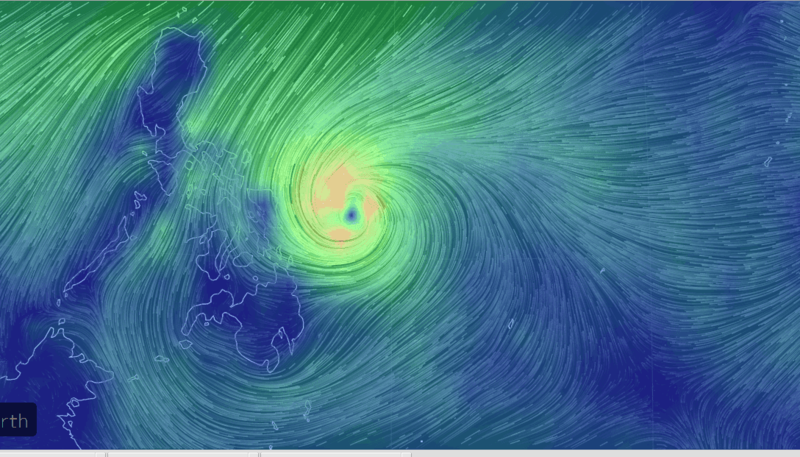 By now most of you will have heard about Super Typhoon Hagupit, which is bearing down on the Philippines. What makes this typhoon particularly horrific is that it is not far from the path of that dreadful Typhoon Haiyan that devastated the Philippines and beyond last November. You can read about this one at Jeff Masters Wunderground blog, and at the Met Office News blog, and read the latest updates on the Japan Meteorological Agency website and the Joint Typhoon Warning Center (JTWC).. Here is the latest storm track from JMA. Edit: I've updated the storm track with the latest and shown the earlier ones as well, in an animation. As always, click to enlarge. Sou 4:44 pm 6 December 2014. 12:14 am 7 December 2014. The reason for the title is that typhoons and tropical cyclones are terrifying and majestic. Here is one of the terrifyingly beautiful images I came across via Leo Hickman on Twitter. Go to the website for the full screen dynamic version. 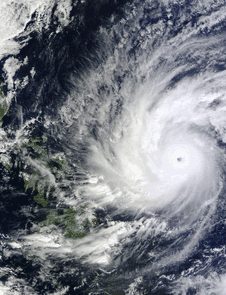 On Dec. 4 at 02:10 UTC, the MODIS instrument aboard NASA's Terra satellite took this visible image of Super Typhoon Hagupit approaching the Philippines. According to the ABC, there are still 25,000 people living in tents after Typhoon Haiyan. Now this. Evacuations are underway, but apparently it's been quite difficult to track the path it will take. At the risk of sounding trite, I wish everyone in the path of this monstrous storm a safe few days. There's not a lot you can say about a long and tedious Tisdale article that explains that the sea surface got hotter because the sea surface got hotter. 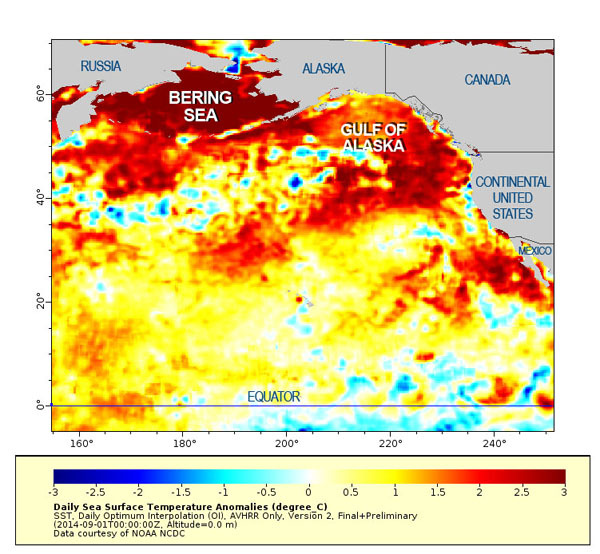 That is, the sea surface in the North Pacific got hotter - plus the sea surface over the equatorial Pacific got hotter. We already know that warming in both areas took place. In any case, it's not just the Pacific that's anomalously warm. Here is a snapshot of sea surface temperature anomalies for October, from the UK Met Office Hadley Centre. If the manmade greenhouse gas-forced climate models used by the IPCC cannot explain the 24-year absence of warming of the surface in the North Pacific, it can’t be claimed that the weather-related warming there in 2013 and 2014 were caused by manmade greenhouse gases. That little bit of common sense eludes alarmists. There's a new study recently published that will probably not surprise anyone, but it's interesting nevertheless. The authors investigated views on environmental issues of US voters. Instead of just splitting voters into Democrats, Republicans and Independents, they split them into four. They split Republicans into Tea Party Republicans and mainstream Republicans. What they found was that Republicans that didn't align themselves with the Tea Party were more likely to have realistic concerns and attitudes toward environmental issues. Similar to Independents. It was those who indicated they were Tea Party Republicans who were batty. And not just about the environment, but about lots of other things as well. Tea Party supporters are less likely than non–Tea Party Republicans to trust scientists for information about environmental issues, accept human evolution, believe either the physical reality or the scientific consensus on anthropogenic climate change, or recognise trends in Arctic ice, glaciers, or CO2. Despite factual gaps, Tea Party supporters express greater confidence in their own understanding of climate change. Independents, on the other hand, differ less from non–Tea Party Republicans on most of these questions—although Independents do more often accept the scientific consensus on climate change. On many science and environmental questions, Republicans and Tea Party supporters stand farther apart than Republicans and Independents. I bet you've heard that before. The part where the Tea Party supporters, despite factual gaps, "express greater confidence in their own understanding of climate change" sounds familiar, too. I wonder, if asked (and answered truthfully) how many WUWT-ers would admit to being Tea Party Republicans? Bob Tisdale, who is known more for his rejection of the greenhouse effect and his tedious, long-winded articles about sea surface temperature, has been trying his hand at comedy lately. Today he's got an article that tries to be funny (archived here). It shows what deniers have been reduced to, now that 2014 is shaping up as one of the hottest years on record. Bob doesn't go so far as trying for an original comedy routine. He's gone around some denier blogs and picked what I presume is the best of the best. Which is not a glowing tribute to the denialati. This is a fairly boring non-article about a fairly boring WUWT non-article. If you're on the home page and click "Read more", don't say I didn't warn you. As a taster - one thing Bob did was highlight the fact that Australia has just had its hottest spring and hottest November on record. WUWT is starting to look like its old self again after something of a hiatus. There's been a cross-post at WUWT of the UAH temperature update on Roy Spencer's blog, which was missed last month. I've covered that one already. Now Christopher Monckton is back with his RSS charts (archived here), trying to claim they prove that global warming is a hoax, or global warming has stopped, or something like that. RSS has been an outlier since 2011. It's as though something crept into the algorithm in 2011 and got stuck there. RSS has the least coverage of all four data sets, only going from 82.5N to 70S. Here are two charts comparing all the data sets, including 2014 year to date average. The top chart shows all the data available in all four datasets. You can see how closely aligned they all are by clicking on the chart to enlarge it. WUWT didn't post last month's UAH temperature report from Roy Spencer. Whether it was merely overlooked or whether Anthony decided it was bad for his readers' blood pressure to know that October was the equal hottest ever in the UAH record, we'll probably never know. Anyway, he did post the report for November (archived here). For the lower troposphere, November was the second hottest in the record (which goes back to 1979 for a full year). This means that 2014 is on track to be the third hottest year in the UAH lower troposphere temperature record. For some reason, 1998 was recorded as the hottest year in the record, followed by 2010. The lower troposphere record seems to amplify the peaks and the troughs much more so than surface temperature records do. The trends are similar, it's just that UAH has higher highs in the hottest years and lower lows in the coolest years. 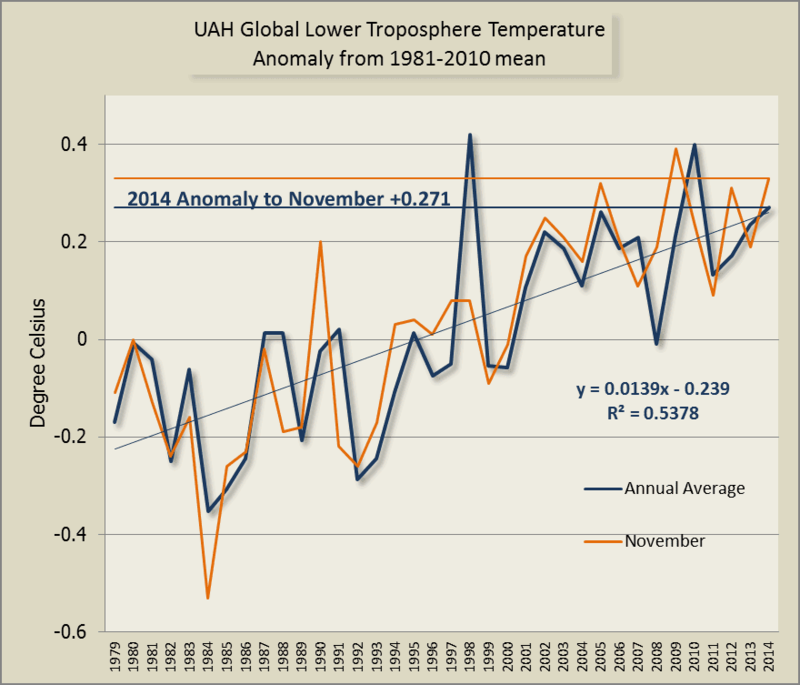 Here's a chart showing the annual temperature and the record for November for UAH. The annual average includes 2014 averaged to November. The only year where there was a hotter November was 2009. While WUWT has slowed to a crawl the science hasn't. So today I'll just write about a new paper in Geophysical Research Letters (GRL). A large team led by Tyler C. Sutterley has found that in fast-melting regions of Antarctica, the rate of melt has tripled during the last decade. The team includes scientists from the USA, France, the Netherlands and the UK and includes some whose names you'll probably recognise, such as Eric Rignot and Isabella Velicogna. They did a comprehensive analysis of measurements of glaciers in the Amundsen Sea Embayment over last 21 years, evaluating and reconciling observations from four different measurement techniques. The loss has been accelerating, a lot. 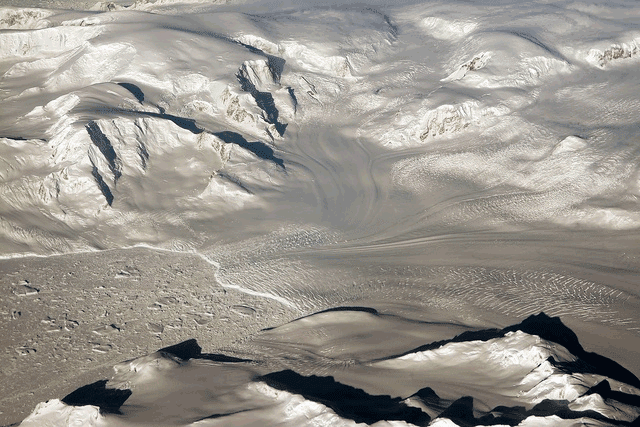 UCI and NASA glaciologists, including Isabella Velicogna and Tyler Sutterley, have discovered that the melt rate of glaciers in West Antarctica has tripled, with the loss of a Mt. Everest's worth of water weight every two years. It also matters to species like us who live on the surface. That's not just because it affects a major source of food (fish) but because of the ocean-atmosphere connections. Warmer oceans means a warmer ocean surface, which has an impact on surface temperatures on the land as well. Plus there are impacts on ocean currents (with consequences for the atmosphere) and melting ice, which are not insignificant.